JUNEAU — A day after Gov. 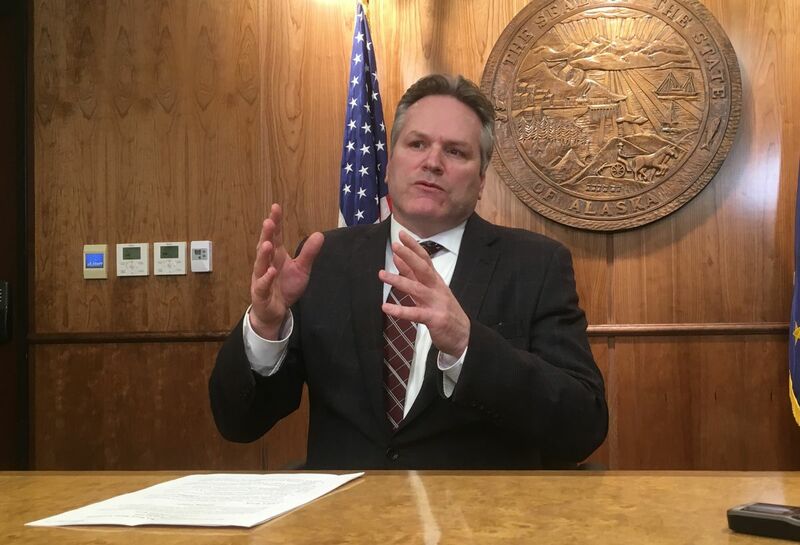 Mike Dunleavy announced he will hold a series of public meetings across Alaska to discuss his budget proposal and long-term fiscal plan, ticketing arrangements reveal the meetings are being sponsored and managed by the conservative-libertarian group Americans for Prosperity. That sponsorship was not disclosed when the governor said he would hold public meetings in Anchorage, Nome, the Matanuska-Susitna Borough, Kenai and Fairbanks next week. The events’ ticketing web pages say, “this is a private, policy focused event dedicated to discussing Americans for Prosperity’s issues,” but that isn’t true, said Ryan McKee, Alaska state director of Americans for Prosperity. “They are open to the public, absolutely,” he said. That partnership was not previously disclosed, nor were AFP-imposed entry requirements to what the governor’s office calls a public event. AFP is requiring preregistration and ID checks at the door. According to the rules on the ticketing pages, no signs or political statements are allowed, the general public cannot “record, reproduce or transmit” any portion of the event without permission, and AFP may remove anyone from the event at any time. McKee said that last clause is intended to allow AFP to remove someone who is being “rambunctious”. “If people want to protest outside or want to shout support for certain things, they’re more than welcome to do that,” McKee said. He said tickets are being provided to those who register online first, and none are being reserved for certain individuals or groups. The events’ web pages were offline Tuesday evening after the initial publication of this story. McKee said he was unaware and would talk with AFP’s IT staff. AFP supports the governor’s proposed constitutional amendments to limit spending and the Legislature’s taxing authority, McKee said. It has not taken a position on the governor’s proposed constitutional guarantee of a Permanent Fund dividend. AFP’s former state director, Jeremy Price, now serves as Dunleavy’s deputy chief of staff. The events will be “a series of community focused discussions and meetings to outline a permanent fiscal plan for Alaska, including the vision behind his FY2020 budget proposal and a package of constitutional amendments meant to address the state’s long-term fiscal stability,” the governor’s announcement said Tuesday. Americans for Prosperty advertises the events differently. “Join Americans for Prosperity-Alaska as they host guest speakers and a panel discussion on why Alaska must face its fiscal reality and implement reforms to curb government’s habit of overspending,” states the ticketing page for the governor’s events. The governor’s statement said he would speak alongside his budget director and revenue director. Americans for Prosperity says its regional director and the executive director of the Alaska Policy Forum will also speak. The governor’s statement did not mention that group’s appearance. The dissonance between the governor’s announcement and the apparent reality of the meetings has upset some Alaskans. Vince Beltrami, president of the Alaska AFL-CIO and a vocal critic of the governor’s budget proposal, said “It’s clear proof that the governor’s cozying up to corporate interests, inviting them in to profitize Alaska while our economy goes down the toilet and we’re on the precipice of losing 15,000 to 20,000 jobs in this state." “We make our own priorities and run our own show here,” McKee said. Joe Geldhof is a Juneau attorney and moderate Republican who supported Mitt Romney, served on Gov. Bill Walker’s transition team and sued the Walker administration for allegedly violating the state constitution. He said even if the sponsorship is innocent, it isn’t a good look for Dunleavy. He compared it to a hypothetical golfing foursome featuring the governor and the heads of BP, Exxon and ConocoPhillips. “They might talk about more than their golf scores. It just looks bad,” Geldhof said. Juanita Cassellius is secretary of the Permanent Fund Defenders, a group advocating the governor’s approach to the Permanent Fund dividend. She was hoping that the governor’s town halls would be open to more people because she believes the governor has more support than has been seen since the legislative session began. “I don’t know what they’re thinking. Do they think they might not have the support?” she said. According to McKee, each of the Americans for Prosperity-sponsored events has space for about 150-200 people. McKee said AFP had considered renting Anchorage’s Dena’ina Center for a larger meeting but were quoted a price of $10,000. That’s roughly equivalent to AFP’s sponsorship of all of the governor’s events statewide, he said, and wasn’t affordable. McKee said he hopes AFP’s example will be followed by other groups across the state.